A historic number of women are running for Congress or governor this year, and Wednesday, the Senate took a historic step: unanimously agreeing to change the tradition-bound institution's rules to allow senators to bring their babies onto the Senate floor during votes. It came about because Illinois Democratic Sen. Tammy Duckworth this month became the first sitting U.S senator to give birth. Senate rules require members to vote in person. 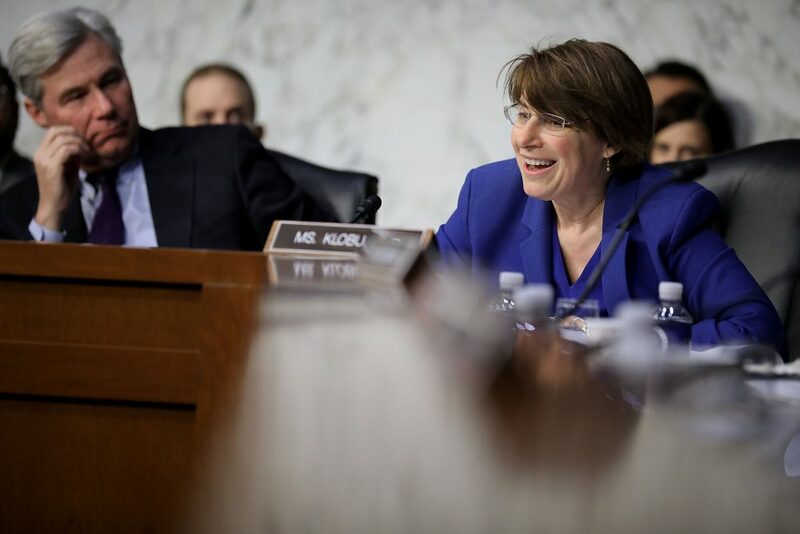 Sen. Amy Klobuchar (@amyklobuchar), a Democrat from Minnesota, helped make the rules change and joins Here & Now's Lisa Mullins to discuss concerns — some of them "amusing" — she's fielded from colleagues. "I head up the rules committee along with Sen. Roy Blunt, the Republican of Missouri, so it was our job to get every senator to agree to this, because we couldn't take a whole week voting on it on the floor. And Tammy Duckworth and I felt really strongly that the legacy Tammy should leave — among many other things — is that it wasn't just an exception for her, that it would apply to all women and men in the future. Because if we're gonna have a more work friendly, family friendly place in the Senate, we don't wanna just be for one mom, we want it to be for everyone and we should be an example for the country." "There's only been 52 women in the Senate, and there have been, by the way, over 1,900 men. So times are finally changing, and we gotta get with it." "Well it was pretty funny, because you've heard some of them in the last few days, some of the senators have publicly said their concerns. [Utah Republican Sen. Orrin Hatch] said, 'Well, what if there's 10 babies on the floor?' And I said, 'Well that'd be great, that'd be delightful, actually, if we had that many senators — men and women — that had young babies, that might be good for the whole place.' Not to mention with all the gridlock, a lot of babies on the floor could be helpful." "Another question I got was about changing diapers and breastfeeding. Can you imagine me talking about this with a number of older senators? I did. But the issue is that she's not interested in doing that. So we didn't really even get to that on the Senate floor. "Then the very last one was questions about if the baby was gonna have to comply with the dress code of the Senate. Now some of that was in jest. But for instance, you have to wear pants or a skirt, and you can't wear a little cap or a hat. You can't wear sneakers, and you can't wear flip-flops. But we have made an exemption for the baby, so the baby doesn't have to comply with the dress code." "I wouldn't rule that out at all. It depends on what the next mom would wanna do. But right now that's not what Tammy wants to do, so it's not an issue, which I assured them. But I think it's very plausible we could allow that at some point. Remember, the Senate rules are not easy to change. We have not allowed for more access to the floor since 1977 — that was the last time it happened, when service dogs were allowed. So one of the arguments I was able to make was that we allowed dogs on the floor, so maybe we could allow a baby. And there's only been 52 women in the Senate, and there have been, by the way, over 1,900 men. So times are finally changing, and we gotta get with it." "The argument we wanna make is, this isn't just about these hundred people and our archaic rules and a weird work schedule, where you work often at 2 in the morning. But what this is about is changing workplaces across America in terms of work-family leave and child care. And if we can't make this minor rule change in the Senate, how are we gonna change the law to match a lot of other industrialized nations, where we actually have good child care policies and work-family leave. We're not there yet in America, and we have a strong economy right now, and a lot of our businesses need workers. And if we're gonna get there, we have to start offering our workers the ability to work while they have kids." This segment aired on April 19, 2018.